Protesters accused the Prime Minister on Sunday of knowing who owned mystery company Macbridge, as they marked the 14th month since journalist Daphne Caruana Galizia was assassinated. Ms Caruana Galizia was murdered in a car bomb explosion exactly 14 months ago, on October 16, 2017. Macbridge was named in leaked documents as one of two companies which would be sending funds to offshore companies owned by minister Konrad Mizzi and chief of staff Keith Schembri. A joint investigation by Times of Malta and Reuters subsequently revealed that the other of the companies, 17 Black, is owned by Electrogas consortium director and Tumas Group CEO Yorgen Fenech. Ms Caruana Galizia was the first person to report on 17 Black's existence and its links to offshore companies owned by minister Mizzi and Mr Schembri. In a statement, Occupy Justice accused the Prime Minister of being complicit in wrongdoing. “Seven months ago we asked the Prime Minister who owns 17 Black, the other company feeding money into the accounts of his top aides. To his shame he never replied but kept covering up the truth,” Occupy Justice said. 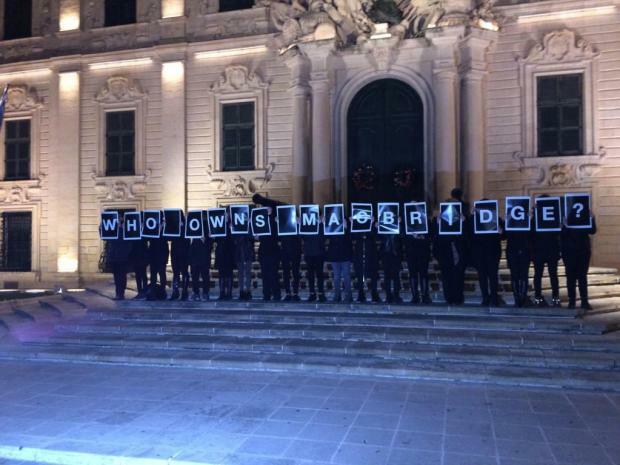 The protesters said that it was obvious that the web of corruption “is here in the Prime Minister’s office” and that they “do not have a shred of doubt” that Joseph Muscat knows. “He has a vested interest in not taking action, which is why he won’t resign and fire his two sidekicks,” they said. Later in the evening, people gathered by the Great Siege Monument opposite the law courts for what has become a monthly vigil in memory of Ms Caruana Galizia. The site is used as a makeshift memorial to the murdered journalist. Four speakers - Occupy Justice activists Rachel Williams and Alessandra Dee Crespo, as well as Julian Delia and Mark Borg – addressed the group which gathered at the site to mark the anniversary of Ms Caruana Galizia's murder. "Daphne would have probably frowned at such an ostentatious display of devotion,” Ms Crespo said. “We are not her supporters or fans, as some conveniently depict us, even in the press, for Daphne abhorred the cult of personality.